Ask fellow campers about "Summit Vacation Resort" and nearby attractions. Level, graveled sites. Most sites are very close. Beautiful grounds behind our site. Clean laundry area, $1.50 per load. Beautiful pool area with gym and hot tub on the RV side, though small which may make it crowded during high peak use. Guests also may use amenities at the Resort across the road. Close to Guadalupe River. Staff friendly and helpful. Very weak Verizon signal; slow wifi and dropped phone calls. 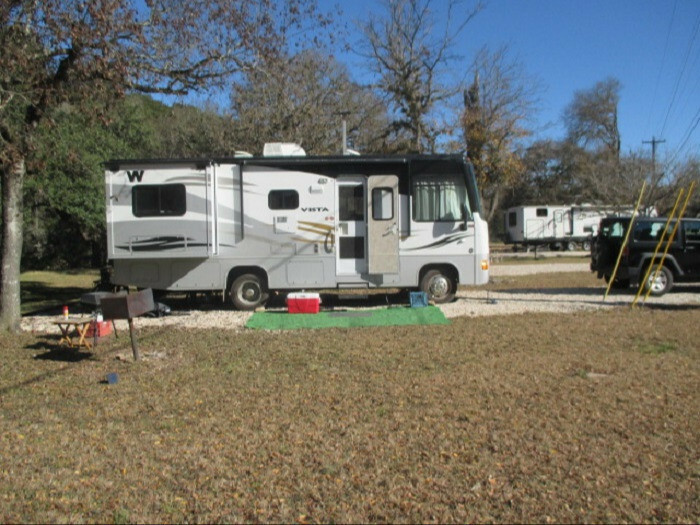 This park is in the Texas hill country which is a beautiful area. Note: you check in at the Resort office which necessitates a U-turn to get across the road to the campground. Large area in which to turn around. We camped at Summit Vacation Resort in a Motorhome. All the major stores are available in New Braunfels about 15 miles away. The historic town of Gruene is a lovely place to wander through shops, listen to music and enjoy a drink or meal. The River Road scenic drive along the Guadalupe River is highly suggested. San Antonio and all the attractions are about 50 miles away. Access to the park was good. Signage was good. When stopping to check in I was a little confused at first by a sign tells you to pull your rig around towards the exit! Check in was quick and informative. Now it makes sense why you are pointed to the exit. 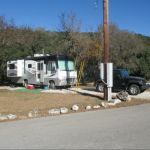 The main RV Park is across the street and down the road a short distance. Perimeter roads are paved and easy to manage. Our assigned site was 34. 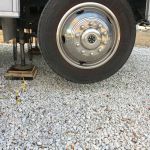 A freshly graveled pull through. It came with a table, power, water, sewer and a rock ring for a fire pit. 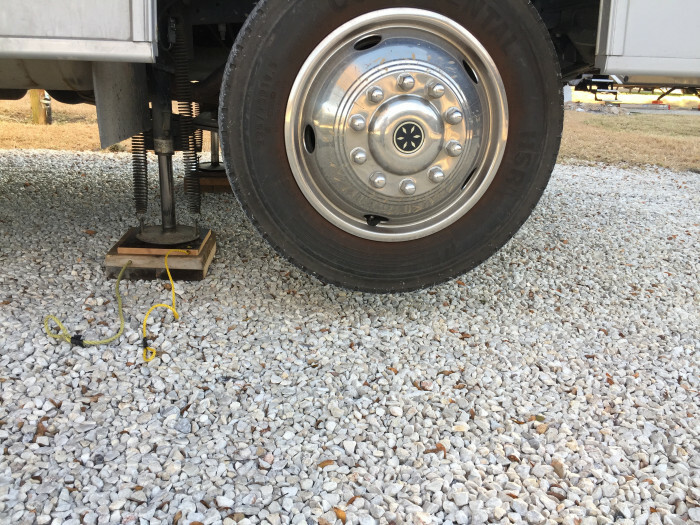 We were able to get level only with the front wheels 8 - 10 inches off the ground. That makes for a huge first step. Back to the office for a more level site. We chose 5. It is a back in with the same features. Much better. Limited cell service and we could not get our Jet Pack to connect. The parks Wifi worked very well. There is no cable TV. We found a very few OTA. The sites are spaced well. Lots of trash cans and doggy doo bags available. We found the park, clean, quiet and well maintained. We checked the bathrooms and they were clean and not dated. We used Summit as a base to tour the area. 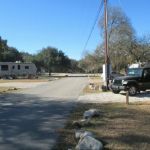 Good access to Gruene, San Antonio and Austin. There are no restaurants or services within walking distance. We paid $29.85 per night including tax (weekly rate) and feel we received good value for our dollar. We would return. We camped at Summit Vacation Resort in a Motorhome. Check our the historic Gruene (pronounced Green) district. Rafting and Tubing appear to be very popular during the summer season. Park is in a pretty area. The Wi-Fi was very strong. We did not have any cell service with our AT&T phones. The spot we were parked in was so un-level our front wheels were off the ground. The hot-tub/spa outside by the pool was not functioning and water was green. The indoor hot-tub/spa had dirty water, the water level was so low the jets were above the water and the water temperature was lukewarm. We camped at Summit Vacation Resort in a Motorhome. We stayed here for 2 nights. In and out very tight in a 45 foot motorhome, but doable. They made sure I was free of trees for sat reception. I was a bit afraid of scratches from trees, but they were trimmed nicely. Very strong wi fi which surprised me. We didn't use restrooms or laundry, but everything looked quite clean. Power was acceptable, although had to run gen when stove, oven and A/C all running at same time. We camped at Summit Vacation Resort in a Motorhome. The park actually has a lot of potential, but just needs to pay attention to some details. It has been operating under a time share type membership until recently so their business model has changed. There are a lot of amenities--pools, mini golf, etc. which are nice if you have a family. It's also at the end of river road so you don't have the party scene like some other places on river road. 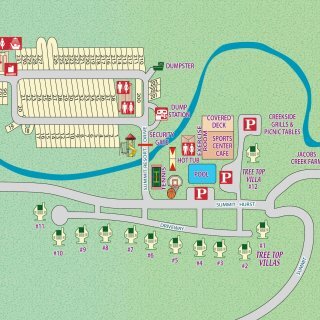 The campground and cabins are separate, so you either have a long walk or a short car ride to get to mini golf and one of the pools. The roads going into the campground need some work; some pot holes and stuff that make it a rough ride. Also, believe they are short staffed as we asked about getting the grass cut, and were told they would try. Two weeks and no cutting!! We camped at Summit Vacation Resort in a Motorhome. Close to tubing, canyon lake. We have stayed here many times over the past few years and have watched the park go from a pleasant place to a profit only motivated park. We have stayed our last time here and will never return. The pools and restrooms facilities are nice, but that is the only good thing I can say. Don't be deceived by the pictures on the website. Unless you are one of their favored members or friends, they will stick you in the back on a lot of crushed rock with no grass or shade and very tight space. Make reservations first and if they tell you the only site you can have is 62 - 77, pass this park by and go to Walmart. Walmart provides a nicer area then these. The ONLY nice areas are in the older section at the front of the park. This park is in a valley and because of the surrounding hills, there is NO cell coverage (despite what the website says). No TV coverage either. Wi-Fi is a hit and miss when it is up, it is extremely weak and more often than not, it is down. Before I checked it this time, I had been reassured that the problems with Wi-Fi had been resolved. - not so. Website states that they have a snack bar - not so. They have closed it down with no plans to reopen. The main person at the front desk that you have to deal with to make site selection is very rude. There are other parks in the area that offer a better value. 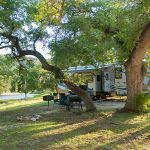 We camped at Summit Vacation Resort in a Travel Trailer. Rude new employee at check-in. We have been coming here for over a year and usually stay several months at a time. Never again. You can no longer use any of the nice spots at the front. Can't reserve them. The sites at the back are the only ones available. They have no cement or gravel on the sites, just sharp large rocks. No shade, no trees, no grass. Very, very narrow spaces. Lots of ants and wasps. Miserable and depressing spots. And no refunds if you don't like it. Office is very picky about anyone coming to visit you. They will be charged. No security over in the campgrounds. We camped at Summit Vacation Resort in a Travel Trailer. Go to Oma Gruene's Secret Garten in Gruene for great music. Thursday, Friday, Saturday and Sunday. Rate reflects C2C membership. Roads to the campground are narrow and winding--but pretty country drive. Staff are friendly & helpful, in fact, the staff are one of the biggest strengths. After checking in, we were escorted across the street and approximately 1/2 mile to the RV/campground section. The roads inside the campground are awful. Most of the amenities are back in the registration area where the cabins are located. 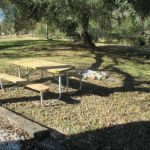 When we called before reserving our site, we were told we would be able to get cell phone and internet connections. In reality the coverage is in very limited areas within the resort. We had to leave our RV to get phone/internet coverage. WiFi is available in office, clubhouse and parking lot. Clubhouse is open for very limited hours. We did see wildlife daily, enjoyed trees throughout campground and river access from the cabin/registration area. We camped at Summit Vacation Resort in a Fifth Wheel. This park was beautiful with nice big sites. Loved watching the deer come in every night. The pools looked incredible but are not heated, so the water was to cold to get in. The bathroom has been newly renovated but needed to be cleaned a little more often. We enjoyed our stay and would love to go again. We camped at Summit Vacation Resort in a Fifth Wheel. This is a very nice park. We stayed 5 nights. The sites are large and flat. We saw deer in the park every night. 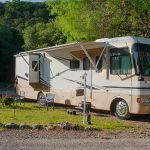 This RV park is connected to a time share resort so all amenities are shared. Nice! Our son and dau-in-law came for a weekend and got a cabin. Very nice! One downfall is that there is no cable and no TV reception on antenna. Thankful for my books and my husband's DVD's. Would definitely stay here again. We camped at Summit Vacation Resort in a Motorhome. We were here 2 years ago. Loved it then, loved it now. I will always look forward to go back here. Also lots to do within 20 miles of the resort. 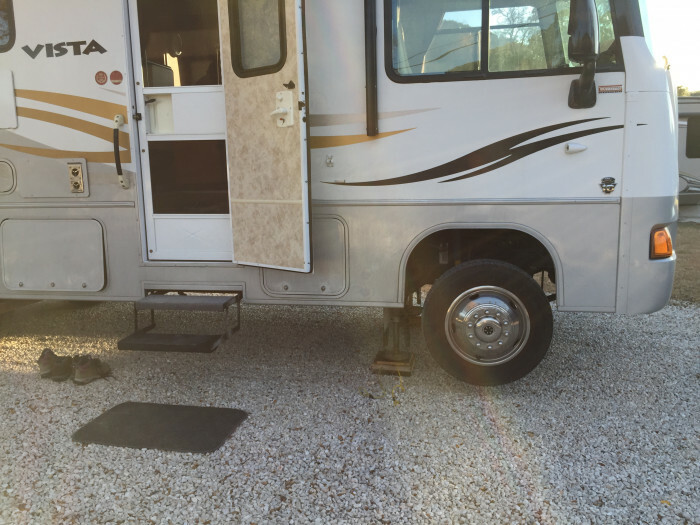 We camped at Summit Vacation Resort in a Fifth Wheel. 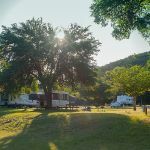 The Summit is a very clean and well organized RV resort on the banks of the Guadalupe River with tubing and all other water sports. 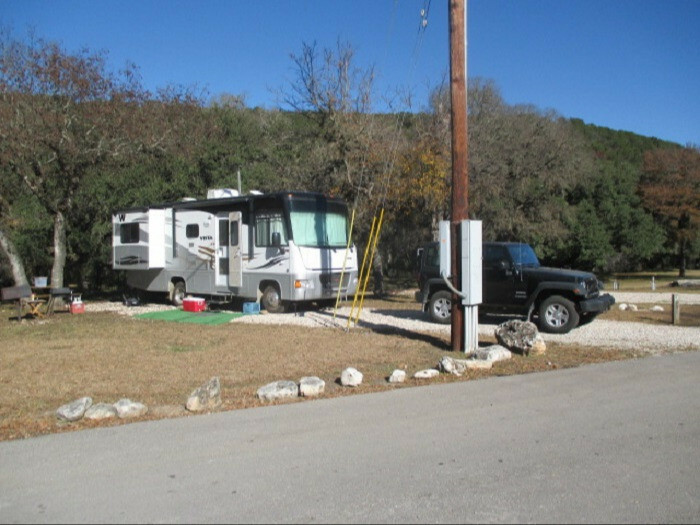 It is a short drive from Canyon Lake which has all the swimming and boating amenities you could want. Friendly staff and security personnel. 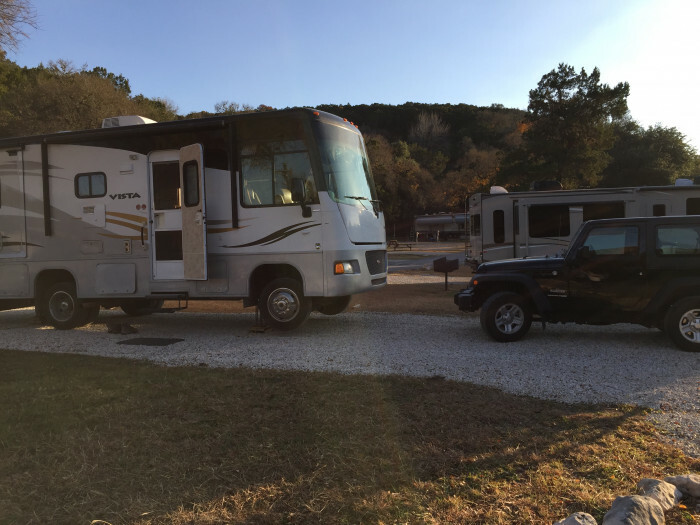 We camped at Summit Vacation Resort in a Fifth Wheel. 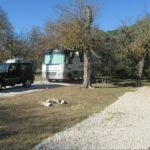 This is a great RV park. If it hadn't been pouring, it would have been even better, but you can't fault the park for that! We stayed for three nights and saw 4-5 deer every day. The site we were in was moderately level. Major problem we had was the poor cell phone reception. 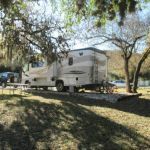 Three days without the ability to make phone calls in the RV was tiring, but if you simply want to relax, you can't do much better than this campground. We would definitely camp here again. 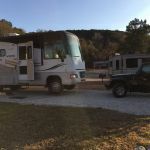 We camped at Summit Vacation Resort in a Fifth Wheel. This is a fantastic place to come and relax. We were here for 9 days. It was very quiet with only 9 rigs. We enjoyed the company of at least 6-8 deer every night. This small valley is splendid. Satellite TV reception was great, and our own broadband for the computer worked just great. We loved the pool and hot tub. Ya'll come down and camp here soon. It's one of the best resorts we've ever been in. 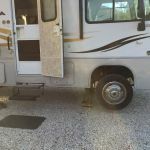 We camped at Summit Vacation Resort in a Fifth Wheel. Definitely a campground that understands "family friendly". Our kids Love Love Love this campground. We stayed last year over a long weekend with some friends. Gotta say they certainly know how to entertain the kids and kept them busy all day with their crafts, game room and laser tag at night. Don't despair mom and dad! These extras are very affordable and considering we didn't have to drive somewhere else to find entertainment was a bonus. We were able to veg by the pool while the kids entertained themselves and then came back together in the evening for a hearty dinner and roasted marshmallows. The only downside was that we had difficulty with the first site they tried to put us in. The positioning of the trees would not allow us to extend our slide, no matter how we maneuvered. They were very accommodating when we asked to be moved - even though we had to pay a bit more for a "premium" site. Laundry room and bathrooms were kept very clean, and the managers were very knowledgeable about the surrounding area. 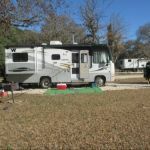 We camped at Summit Vacation Resort in a Travel Trailer. Are you affiliated with Summit Vacation Resort ?